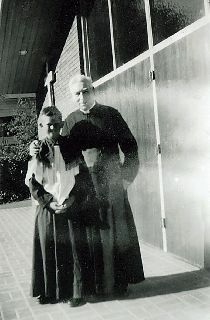 In the 1890�s the Catholics of Boulder Creek, California, met in homes with Reverend Father Michael A. McKey, S.J., who resided in Santa Clara, CA. On weekends, Fr. McKey would travel by train to Boulder Creek to celebrate Mass and provide Sacraments in the homes of the early congregation before the first Catholic Church was built in Boulder Creek. In May of 1899, it was decided that the new Catholic Church in Boulder Creek would be called �St. Michael�s� after the Archangel Michael, the guardian of the Catholic Church and the supreme enemy of Satan and his minions of fallen angels. In mid-November of 1899, work was commenced by a carpenter, Mr. Potts, building the new church structure just south of S. H. Rambo�s brother-in-law�s residence. By the second week, the foundations and floor joists were laid and the nave measured 28 by 55 feet with a sacristy in the rear measuring 16 by 18 feet. By February of 1900, G. E. Fail and Frank D. Fumagelli of Los Gatos began painting the new church building. St. Michael�s Church was officially dedicated in 1901 with Most Reverend William Riordan, the second Archbishop of San Francisco officiating. In 1904, H. L. Middleton donated an altar to the new church. 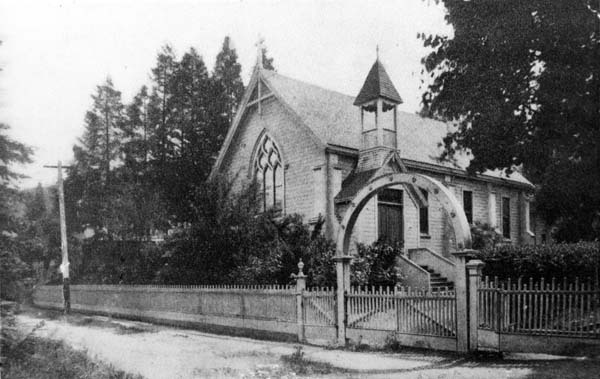 St. Michael�s Church congregation, later in 1906, dedicated a bell which stands today and can be found behind the current parish rectory. Who is like unto God. The first parish rectory was the home of Fred Moody which was purchased a few years later to provide a residence for parish priests. During this period, 1906-1908, the Woman�s Christian Temperance Union was very active, trying to close down the large number of saloons in Boulder Creek. Once, passions were so inflamed among the angry saloon patrons when the Temperance Union succeeded the closing of every saloon in town, the patrons went out and had set the local Methodist and Presbyterian churches on fire. St. Michael�s escaped the wrath of the anti-Temperance residents. During this early era, 1907-08, St. Michael's parish started to provide Catholic catechism to parishioners. Upon request by Fr. McKey, a chapter of the Sisters of the Holy Family in San Jose, would begin their mission to teach catechism to a few children of St. Michael�s on the weekends in Boulder Creek. They would travel the relatively long distance from San Jose to Boulder Creek through a long and mountainous trip by train. 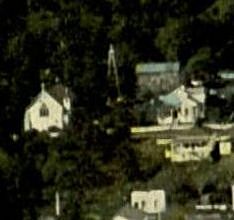 An early aerial photograph of Boulder Creek (top, left side) with old St. Michael's Church in the bottom left. The bell tower (right side photo), built in 1906, can be seen to the right of the church. The old church was approximately located where today's Parish Hall and Rectory is now located. Old St Michael's Church, circa 1920's - photo courtesy of San Lorenzo Valley Museum in Boulder Creek. Rev. 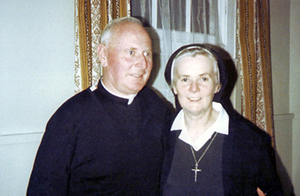 Thomas O�Brien, was appointed first Pastor, in 1921 by the Most Reverend Edward J. Hanna, the third Archbishop of San Francisco. 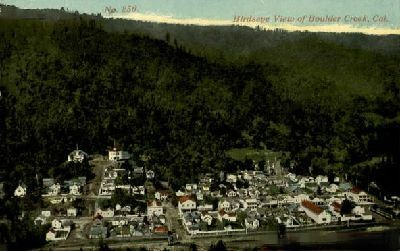 The Diocese of Monterey accepted the responsibility of the parish in 1922. 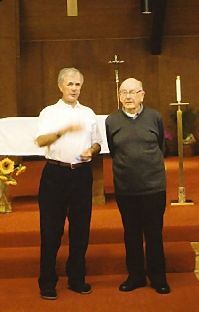 As the Catholic community in Boulder Creek and surrounding area grew in size, doubling by 1950, a new rectory and church was required to support the growing congregation. The old first church was razed and the current parish hall was constructed as the new church. Boulder Creek, California - The Catholic Church is a beautiful and modern building set among the redwoods in this Santa Cruz Mountain center. Mass was celebrated in the old church until 1967 when Msgr. 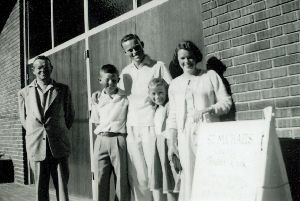 Eamon Mac Mahon built the new redwood church on the corner lot. Ground-breaking was in 1968. 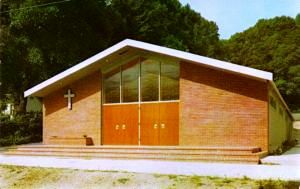 The current church building was completed and consecrated in 1969 by Bishop Harry Clinch. With the consecration of the new church, the old church was then converted to be the new Parish Hall. 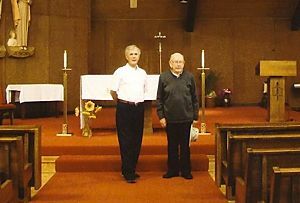 Father Bob and Monsignor Eamon MacMahon look over the sanctuary. Msgr Emon was responsible for building St Michael's current church. The current church of St. Michaels was built in 1968.